London, Oxford University Press, 1943. E. E. Reynolds, B-P: The Story of His Life, is a major source of biographical information about B-P. It is one of several works by E. E. Reynolds documenting the life of the Chief Scout and the early days of the Scout Movement. Reynolds served the Chief on the Headquarters Staff of the Scout Association for many years and was editor of The Scouter. In 1942, he was selected by the Headquarters Committee to write the official biography of B-P. The result was Baden-Powell: A Biography of Lord Baden-Powell of Gilwell, published in 1942 by the Oxford University Press. B-P: The Story of His Life (Oxford, 1943) was an adaptation of the official biography for younger readers. Reynolds authored a number of other books on Scouting, including The Scout Movement (Oxford, 1950) and Boy Scout Jubilee (Oxford, 1957). 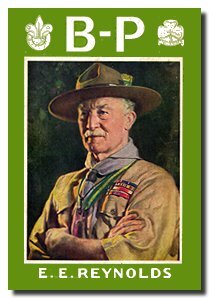 Sir Robert Baden-Powell, Founder of the World Scout Movement, Chief Scout of the World. A Home Page for the Founder. Links Relating to Baden-Powell on the Pine Tree Web and elsewhere. Text Only Index.